We are delighted to have been awarded Bronze at the WhatHouse? Awards ceremony last Friday for 92-94 Stamford Hill. “This development of 68 homes, and commercial office and retail space, designed by architect Stockwool, replaces a small industrial warehouse and commercial premises that was at odds with the largely residential nature of the area. The massing of this number of units feels comfortable to the local surroundings and the dark brick and dormer windows and balconies take their reference from the chimney stacks of the adjoining mansion blocks. 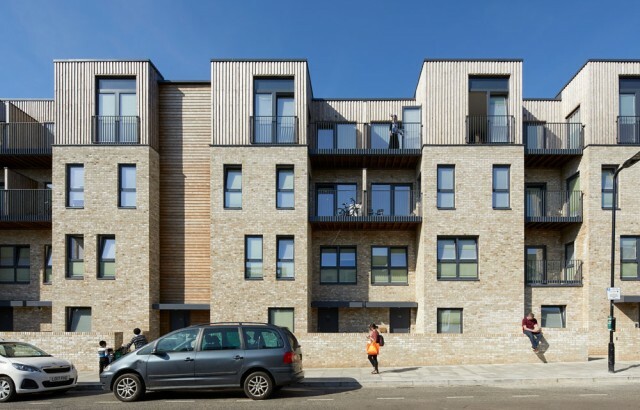 The development is located in a predominantly Jewish neighbourhood of north London and the needs of the local community have played strongly in the approach to the design. Flat layouts and open spaces have been carefully considered and integrated, and the majority of flats and houses face a hard landscaped internal courtyard,which was buzzing with activity with children playing when we visited, replicating a street scene that would be difficult to achieve in this built-up area otherwise. Key details like the staggered balconies allow the residents to celebrate the festival of Sukkot outside, open to the sky above.